Petaluma Vale grew up in a surprisingly lovely pocket of New Jersey, where she quickly discovered a love for singing by repeated viewings of The Sound of Music and learning goofy songs at Girl Scout camp. 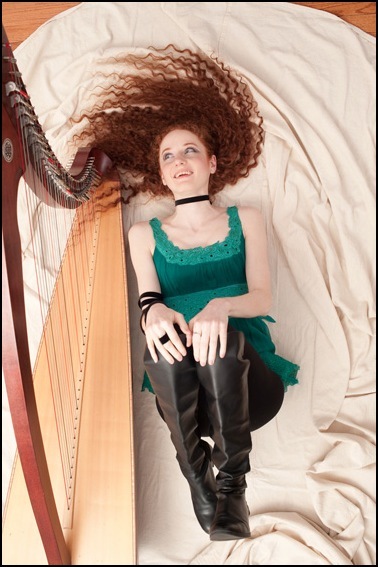 She took piano lessons, and later switched to harp, learning through an Irish folk method as a part of a group that performed as a side act for the late Irish tenor, Frank Patterson. With this group she got to play in many venues, both fancy and humble, throughout the New York City tri-state area. She also busied herself with other arts-related activities, such as Irish step dancing and musical theater. Later on in college she taught herself basic guitar, and wrote her first songs. She has been performing her songs ever since, and additionally joined the art-rock band Jaggery in 2007 as harpist and backing vocalist. Petaluma also writes poetry, learning from such great teachers as Scott Hightower, Marie Ponsot, Denise Duhamel, and Elisabeth Frost. Her first published poems appeared in the debut edition of the literary journal Constellations in the Fall of 2011. In the summer of 2012 she moved from her home Garden State to Cambridge, Massachusetts, which she has taken to like a bird to the sky.